Well, back home now, it was Sunday and I didn’t have work, baking time. Normally I would be going down to see my girlfriend and getting some help from her with the baking. Well, she is in Alaska now so she wasn’t helping this time. 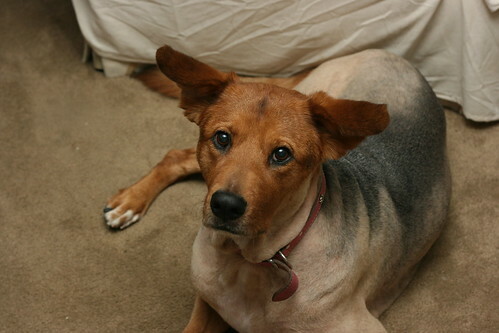 But I still went down to visit her family, the pooch… and the oven. I had an ovenfull of breads on the roster for the day, still keeping with the Bread Baker’s Apprentice Challenge. First for the day was Portuguese Sweet Bread and then both sourdough and commercial yeast Italian Bread. The Portuguese was added to the roster at the last minute when I realized I needed sandwich bread for lunches. The Italian Bread on the other hand was just for fun! Well, I also wanted to test my new brotforms… I didn’t manage to get photos of every step, I was too busy and distracted for that. 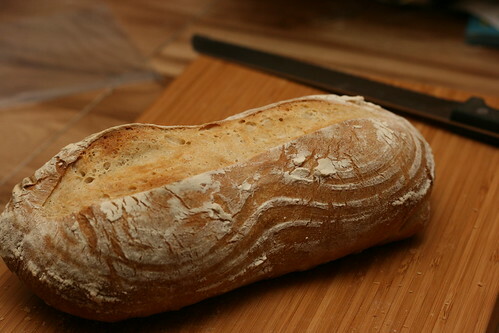 The Portuguese bread started out with a sponge, it was practically thinner than pancake batter. Sponges are always really easy to mix up, they have so much water that they take no time at all. 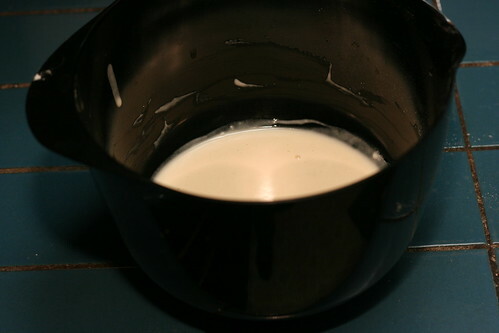 The next thing to mix up was the powdered milk, sugar, salt, butter, and shortening. Now the lemon, orange, and vanilla extracts and the eggs go in. Now that we’ve got all that together it is time for the sponge (very bubbly by now!). I didn’t get any pictures here, but I’m sure you can imagine how that looked then mixed in with the other ingredients and the flour. After the dough rose for about 2 hours, I pulled it out of the bowl, divided it in half and shaped it for pan loaves. 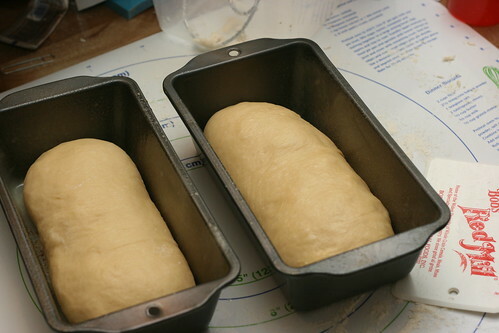 Left those to rise again, thinking maybe I just should’ve made one loaf in a larger pan. 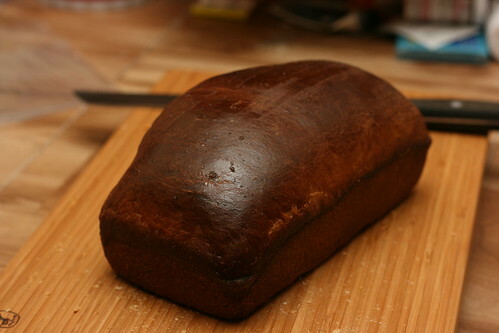 This ended up being a pretty easy recipe, although I think I may have overbaked it slightly, the recipe stressed to bake it dark enough, I think I went a bit too far. The crust is definitely a bit closer to burn than I prefer, but not as burnt as it looks! I’ve been loving the bread for sandwiches but I think I might lower the extracts some if making it again, they are a little too strong and somewhat distracting from the rest of the flavor. 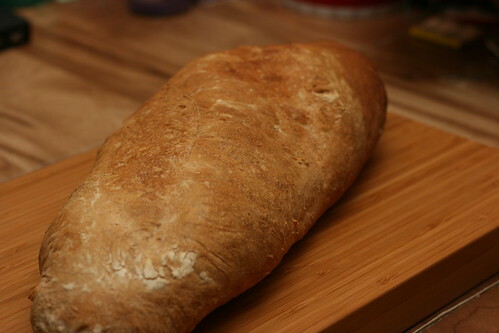 And on to the Italian Bread. 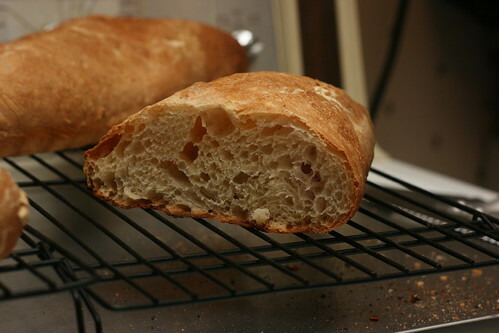 As I mentioned I did both commercial yeast and sourdough versions of the Italian Bread. 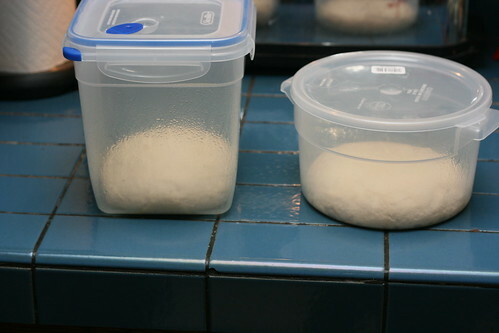 Both versions started with a biga, adapted into a sourdough version and the regular biga from Bread Baker’s Apprentice. 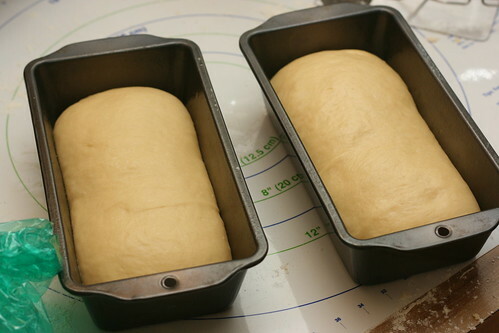 Both of them got mixed up, rested, were kneaded slightly, and put in containers to rise. After the bigas rose I gave them a fold and turn in the bowl and stuck them in the fridge to wait for Sunday. 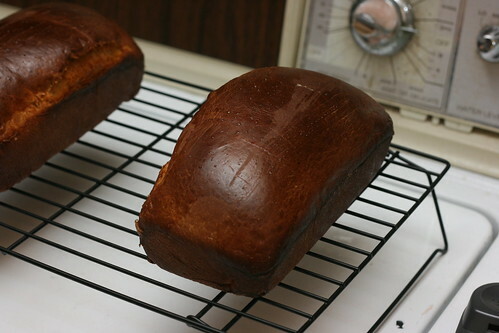 I took them out of the fridge a little more than an hour before I started making the loaves. 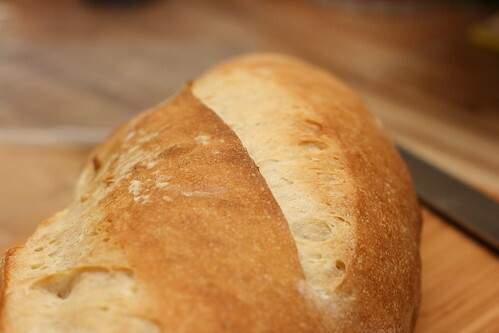 After they had a chance to warm up and wake up, the bigas were mixed with the rest of the ingredients: flour, sugar, salt, diastatic malt powder, olive oil, water, and yeast (except for the sourdough). What you don’t see in that picture is the extra cup of water I put in the recipe. Yes, an entire cup. 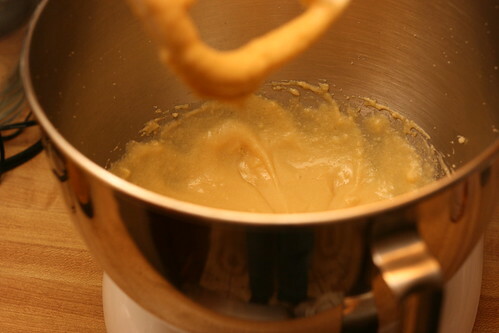 Yes, the recipe only calls for 3/4 cup to 3/4 cup + 6 tablespoons. Needless to say, I was rather surprised after I mixed up the dough. 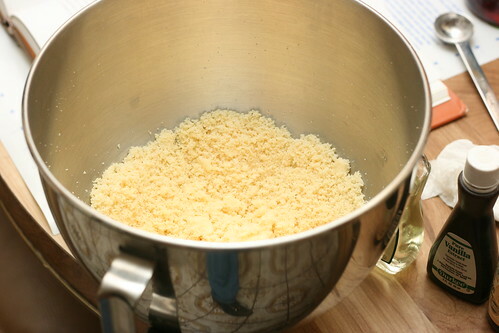 I didn’t realize at the time what mistake I had made, so although I added quite a bit of flour I did it reluctantly and slowly because I thought I was really deviating from the recipe. 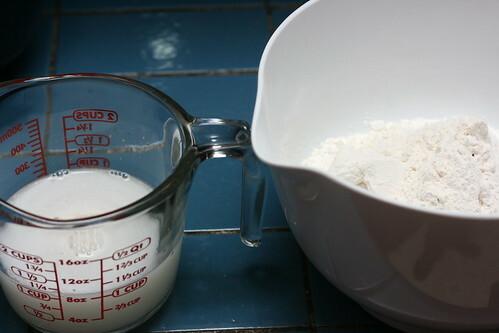 (Yeah… the FLOUR is where I deviated, right) It was impossible to knead the dough so I used my scraper to fold it over itself and then gave it a number of folds as it rose. 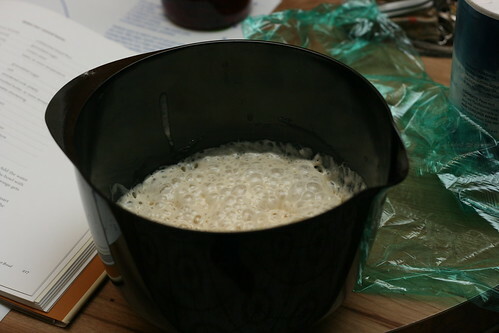 It became a bit more workable, but it was still a very wet dough rather sticky. It was rather tricky trying to shape the dough into batards, and because so much extra flour and water had been added I had enough to try out one of my new brotforms. So into the brotform went that dough piece, the other two rough batards I put on lightly floured parchment paper (arranged as a couche) to proof. It turned out the lightly floured was a bit too lightly. When the loaves seemed adequately proofed I put more parchment paper on my peel and turned the batards out onto the peel. The parchment paper I had them rising on stuck to them… quite well. I tried my best to slowwwly pull off the parchment without deflating the loaves, or taking so much time they developed a skin. Once I finally had them unstuck came the trick of scoring them, they were so wet that they really didn’t score all that well and I deflated them even more then. Well, finally, after all of that time for them to go in the oven. Here is where I hit the final snag, I didn’t notice one of the two loaves had oozed off the parchment onto the peel and when I put the loaves in the oven it stuck part way to the peel, enough so that if I pulled the peel out the loaf would come too! I reached for a knife off the counter and managed to scrape the dough off the peel, earning myself a small burn in the process (bumped my arm into the oven). 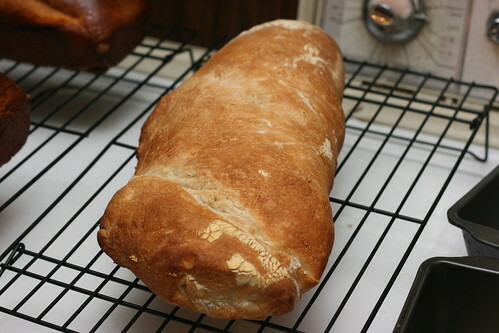 The loaf was okay, if somewhat oddly shaped now. They turned out pretty well for all the problems that came along with them. 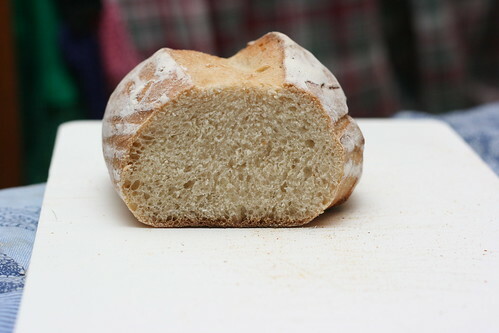 I was especially surprised at how open and irregular the crumb was and the amount of oven spring, after all the deflating from the parchment paper and the scoring. 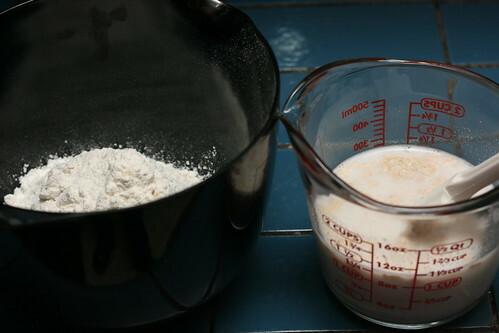 By the time I was mixing the sourdough recipe I had realized what went wrong with the first bread and I got the water amount correct. 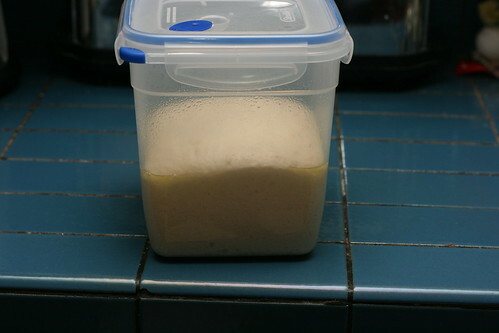 Hence, the sourdough went much more smoothly and was not anywhere near as hydrated as the commercial yeast version was. It was almost a bit too dry as the only difficulty in shaping this time was getting the seam to seal! 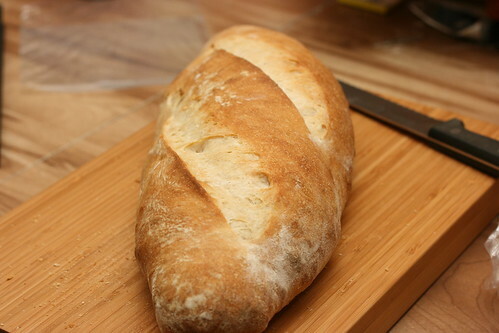 I shaped most of the dough into a large batard, while the smaller portion I used to test out my other new brotform. The sourdough version also had a very uneventful transfer to the oven, no sticking, easy scoring, no burning of extremities. Got some good oven spring on the sourdough loaves as well. 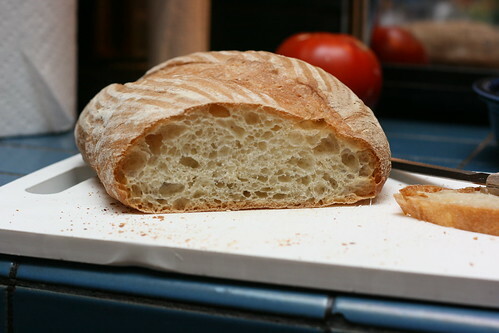 The crumb on the sourdough loaves ended up being much finer and more regular than the commercial yeast loaves, probably due to the much lower hydration, as well as the increased handling during the kneading. All in all, it was a good day of baking even if I got a little scar here and there. 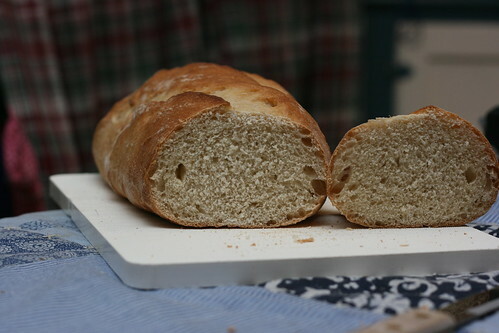 I definitely want to make both breads again. 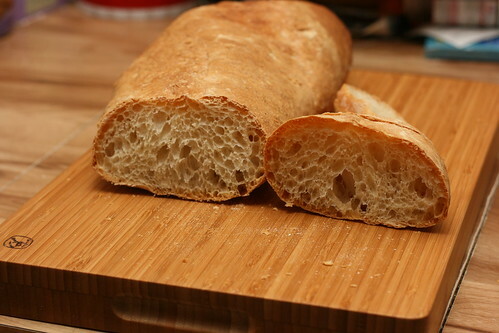 The Italian bread (especially the commercial yeast version) had absolutely amazing texture right after it came out of the oven, it would’ve made really good fresh toasty sub rolls. I think I need to play with the recipe a bit and try to get near the hydration I ended up with this time, as it was almost perfect. 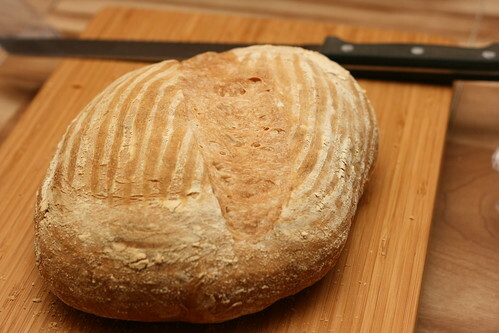 The sourdough loaves turned out quite well too, although I think they definitely could’ve used a little bit more water. They were much less sour than the last few loaves of sourdough I’ve made, a definite plus for me as the sour part of the sourdough flavor is not my favorite. Your assistance looks a little sad. I think he wanted more bread for his contribution. All the breads looked delicious and I am looking forward to trying the Portuguese one, the lemon, orange, and vanilla extracts sound yummy. Very nice loaves — worth a few scars! 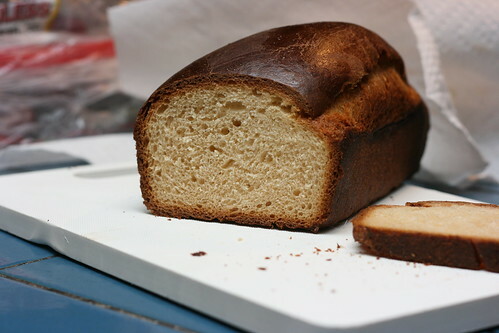 Better too dark than too light on the Portuguese sweet bread, I think. I love that bread. Thanks for joining YeastSpotting! I just hope not to make a habit out of the scars! The Portuguese sounds delicious, and the other breads look gorgeous, too.